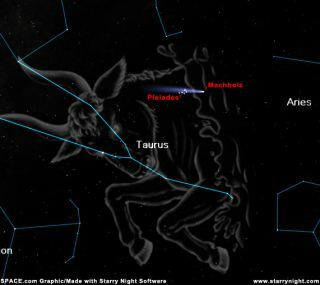 SKY MAP: Comet Machholz near the Pleiades star cluster on Jan. 7, from mid-northern latitudes at 9 p.m. local time. As 2004 draws to a close, skywatchers have yet another opportunity to view a naked-eye comet. Comet Machholz has been brightening steadily and conditions are now prime. So far this year, there have been four comets that have managed to attain naked-eye visibility. Last spring, comets Bradfield (C/2004 F4), NEAT (C/2001 Q4), and LINEAR (C/2002 T7) all reached third magnitude, while in July another comet discovered by the automated LINEAR project (C/2003 K4) briefly peaked at sixth magnitude. On the astronomers' magnitude scale, smaller numbers denote brighter objects. The dimmest objects visible under perfectly dark skies are about magnitude 6.5. Discovered on Aug. 27 by veteran comet hunter Donald E. Machholz of Colfax, California, comet Machholz (C/2004 Q2) has been brightening steadily during the past several months while approaching both the Sun and Earth. This comet currently is glowing at around magnitude 3.5 and is visible to the naked eye in dark, non-light polluted skies, though much better seen in binoculars or telescopes. This kind of brightness makes Machholz a very fine comet from the viewpoint of a serious amateur astronomer, but it doesn't appear that this comet will become the kind of spectacle that Comet Hale-Bopp was in grabbing the broader public's attention. Yet this is an auspicious circumstance, as Machholz is now the fifth naked eye comet in 2004. Twice before, in 1911 and again in 1970, four comets managed to reach naked-eye brightness within a single calendar year. But when Andrew Pearce of Noble Falls, Western Australia saw the comet without any optical aid on Nov. 19, it put 2004 into the books as a record year for naked-eye comets. At this moment the comet's motion across the sky is toward the north, making it increasingly well placed for Northern Hemisphere observers. During January, according to calculations made by Brian Marsden of the Smithsonian Observatory in Cambridge, Massachusetts, the comet will move north of the celestial equator, tracking from southern Taurus on up into the constellation Perseus. From a brightness standpoint, the comet has also been performing excellently; in fact, running nearly twice as bright as predictions had originally suggested. Observers who have looked for the comet during the late evening hours could readily see its bright, bluish-white head surrounded by a fuzzy cloud of dust and gas called the coma. A couple of weeks ago, Mike Begbie, observing from Harare, Zimbabwe with 15x60 binoculars, said, "The comet is becoming spectacular. The coma is highly condensed and the dust tail is broad and prominent." "I couldn't take my binoculars off the comet!" exclaims Brian Summers, a magazine editor from Katonah, New York. "It was an 'instant pickup' - just point the binoculars and there it was!" "Machholz's comet very much reminds me of Comet Kobayashi-Berger-Millon," said Long Island, New York amateur, Sam Storch. "I remember that comet from the summer of 1975 and like Machholz, it passed relatively near to the Earth and also displayed a very condensed nucleus and a large coma." John E. Bortle, a well-known comet observer from Stormville, New York, describes Comet Machholz as "a strange looking beast; its tails are relatively weak, but the separation (lag-angle) between the classic ion tail and the "thing" that passes for a dust tail, is huge (more than 90 degrees!)." Bortle believes "the comet will continue to be a very nice sight in January when we can view it high in the evening sky." During mid-December, the comet's coma appeared ? degrees across (equal to the apparent size of the full Moon). That size translated into an actual diameter of 384,000 miles and with Machholz continuing to approach both the Sun and Earth in the coming days, the coma's size can only continue to grow larger. Comet Machholz will be closest to Earth on the night of Jan. 5-6, 2005, when it will be 32,256,000 miles away. On the evening of Jan. 7, it will conveniently pass just a couple of degrees to the west of the famous Pleiades star cluster, making for a pretty sight in binoculars [Map]. The comet will probably be cresting at its brightest right around this time, perhaps peaking at around magnitude +3.3, which would make it equal in brightness to Megrez, the star that joins the handle with the bowl of the Big Dipper. "I have been most impressed with recent views of comet Machholz from Palm Springs, California," writes Robert Victor, an astronomer who served for many years at the Abrams Planetarium of Michigan State University. "I am looking forward to its passage near the Pleiades in early January." "It has been a pleasure for me to watch this comet grow and develop," Don Machholz told SPACE.com. "I have also had a few months to plan for the time when the comet reaches this point. As a result of having a bit of lead time, I wrote a PowerPoint talk, giving it at local astronomy (and other) clubs during the last couple of months. "In recent weeks, while the comet has been rising during the mid-evening hours, I've been inviting friends and neighbors to my house for 'private' viewing of the comet," Machholz said. "Other local astronomers and I will be holding a series of public star parties at various locations in the foothills, showing the comet and Saturn and other stuff to the public. We've been doing public star parties for years, but I believe this is the first time we've been able to show a Comet Machholz." A schedule of upcoming talks by Don Machholz can be found here. Continuing northward, the comet will slip less 2 degrees to the east of the famous variable star, Algol in Perseus on the night of Jan. 16-17. The comet will reach perihelion at around 22 hours G.M.T./5:00 p.m. EST on Jan. 24, when it will be 112,019,920 miles from the Sun. Since the comet will be more-or-less opposite the Sun all during this "flyby," it should easily be visible in a dark sky. Then during February, March and April, Comet Machholz will become circumpolar from mid-northern latitudes. Or in other words, during this time frame it will always remain above the horizon, appear to neither rise nor set. During the second week of March, it will pass within half-dozen degrees of Polaris, the North Star. Our latest "guesstimates" Machholz's brightness in the coming weeks, is for it to gradually dim to about fourth magnitude by the end of January and to around fifth magnitude by the third week of February. Those blessed with very dark skies might even be able to continue following the comet with just their unaided eyes until about the middle of March. Of course, the comet could always dim much more rapidly . . . or, conversely, a sudden unexpected flare-up could also occur as well. But these are extreme cases. So far, the comet has performed very well and there is no reason not to believe that it will continue to delight Northern Hemisphere observers for at least several more weeks. Once again, we should stress that the darker your observing site, the better the comet will appear. With the bright Moon pretty much out of the way during the first half of January, prospective comet observers are likely to have their greatest success. After comet Machholz whirls around the Sun on Jan. 24, it will head far out into space. Traveling in a highly elongated orbit, taking it far beyond the known limits of our solar system, it could again return to the vicinity of the Earth and Sun about 119,000 years from now.